If your kids are still very young and you want to take them biking with you, you have mainly two options: either install a child seat on your bicycle or else acquire a bicycle trailer. There are a number of problems and risks associated with the first option. For starters, having your child sitting in a seat installed on your bike could affect your equilibrium and require a lot more effort and attention on your part for safe biking. Furthermore, sitting on your bike, your child will not be protected from bad weather, bugs, and flying debris. And if you have more than one child, it would be quite difficult, if not impossible, to take both along for a ride. Bike trailers are equipped with protecting canopies against bad weather, bugs and flying debris. Not only do these trailers not affect negatively your equilibrium, but on the contrary they improve it and provide more stability. Most bike trailers are made to carry two passengers. The best bike trailers are equipped with 5-point harnesses to ensure the safety of your children. Note that some bike trailers are convertible into a stroller, so that when you have reached your destination by bike, you can convert the trailer into a stroller and continue your outing with your kids on foot or jogging. This article will compare InSTEP Take 2, InSTEP QUICK N EZ, Allen Sports AST2 and Allen Sports AST200 bicycle trailers. These four bicycle trailers were not just the most popular among Amazon customers at the time this article was written, but they had also received excellent reviews from most Amazon buyers (an average of 4.5 stars each out of 5 stars!). All four trailers considered here can carry 1 or 2 passengers. But with either InStep trailers the maximum weight carried must not be over 80 lbs. Also with either Allen Sports trailers the maximum weight carried must not be over 100 lbs. All four trailers considered here have 16” pneumatic inflatable rear tires with molded rims that provide performance and style. 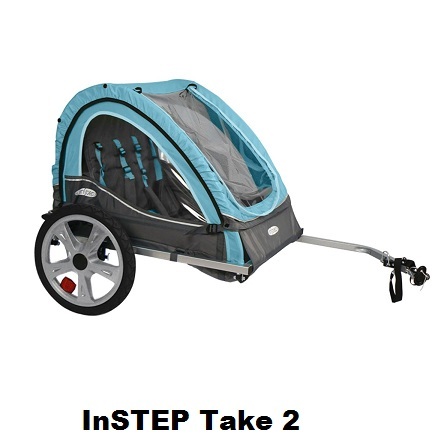 Both InStep QUICK N EZ and Allen Sports AST200 come with an additional small swivel front wheel that you install when you want to use the trailer as a stroller. All four trailers considered here have a folding frame design with quick release wheels that enable compact storage. Both InStep trailers are equipped with a canopy with bug screen and weather shield. Both Allen Sports trailers are equipped with a four-season cover designed to keep passengers and cargo dry and warm in bad weather. The four-season cover also protects the passengers from flying debris. It can be rolled up to allow for added ventilation in hot weather. Velcro closures keep the four-season cover in place when rolled up. All four trailers considered here are equipped with a 5-point safety harness for safety. Versatile and universal couplers attach to almost any type of bicycle. 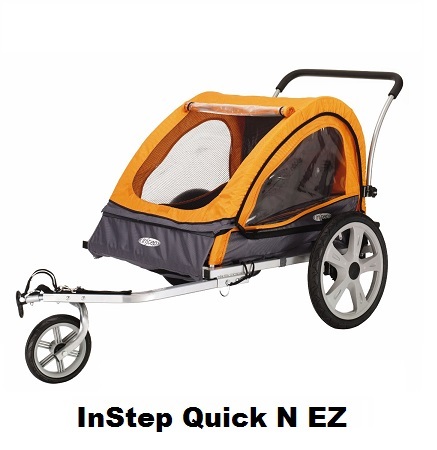 InStep QUICK N EZ Includes stroller kit with swiveling front wheel, parking brake and handlebar. 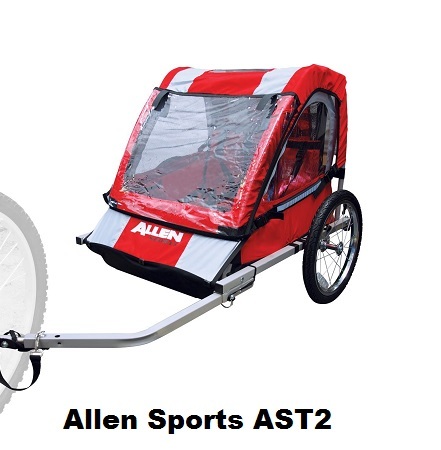 Allen Sports AST200 includes adjustable jogger handle and swivel front wheel for easy convertion to stroller. 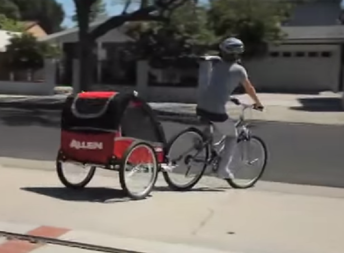 The picture shows the Allen Sports AST200 trailer converted into a stroller. So which bike trailer to get? Note that all four trailers considered here are excellent products as the reviews and ratings provided by Amazon customers who have bought and used them show. Indeed, at the time this article was written, these trailers had each received an average rating of 4.5 stars out of 5 stars! If you need a trailer that can be converted to a stroller, you should choose either the InStep QUICK N EZ or the Allen Sports AST200. If your trailer's passengers weigh together more than 80 lbs, you should definitely get an Allen Sports trailer as they can carry weights up to 100 lbs. Allen sports provides a better warranty which is lifetime limited vs. 1-years limited provided by InStep. Compare Kids' Pull-Along Canopy Wagons: Radio Flyer or Step2?